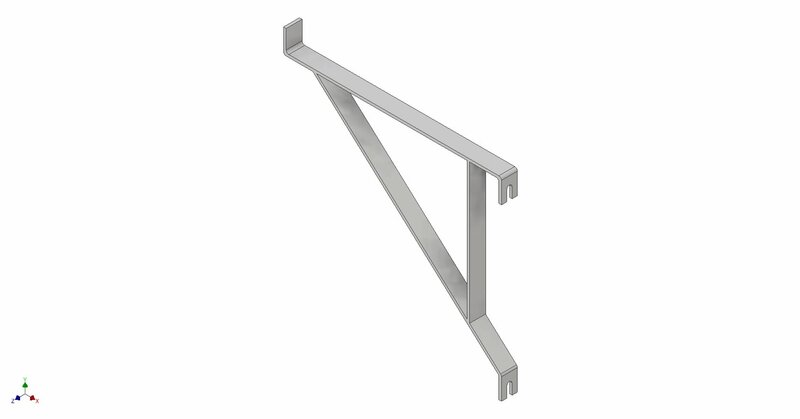 20" Aluminum Scaffold Bracket - Can be used on any panel. The top is attached to a bolt on the panel and the bottom is secured with a nail into the panel. 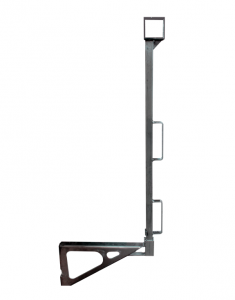 This scaffold bracket is also available with a 2" x 2" pocket or a 2" x 4" pocket to install a guard rail for working at heights. 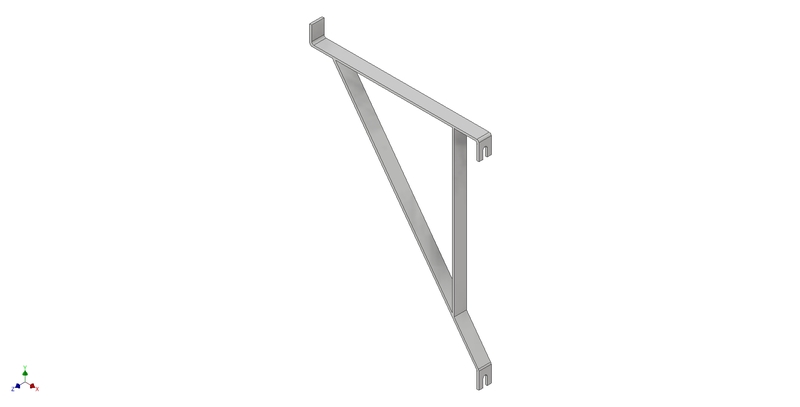 20" Steel Scaffold Bracket - To be used with the 8' 4 bar system. Attaches to two bolts on a panel. 20" Steel Scaffold Bracket - To be used with the 8' 6 bar system. Attached to two bolts on a panel. 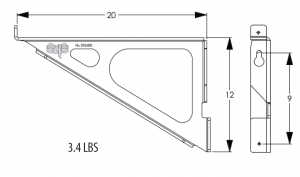 OPERATIONAL MANUAL FOR 20” STEEL SCAFFOLD BRACKETS SOLD BY CORRIVEAU CONCRETE FORMING SUPPLIES LTD. CAUTION: READ AND FOLLOW OPERATING INSTRUCTIONS. THIS IS ONLY A GUIDE AS CONSTRUCTION SITES VARY GREATLY AND WE CAN NOT BE RESPONSIBLE FOR HOW THIS PRODUCT IS USED. USE PRODUCT AT YOUR OWN DISCRETION. FAILURE TO DO SO CAN RESULT IN SERIOUS INJURY OR EVEN DEATH. PLEASE CHECK WITH YOUR HEALTH AND SAFETY OFFICER AND THE MOST RESENT OCCUPATIONAL HEALTH AND SAFETY ACT AND REGULATIONS FOR CONSTRUCTION PROJECTS FOR ANY ADDITIONAL HEALTH AND SAFETY PROCEDURES THEY MAY BE IN PLACE. · Scaffold brackets should be checked before and during use for any defects. Defects should be noted and repaired by a qualified person before scaffold bracket is used. If damages are beyond repair the scaffold bracket should be taken OUT OF SERVICE, recycled (where recycling facilities exist) and replaced. · Only those people deemed competent should work with or near this product. · Stay alert. Do not use this product when you are tired, ill, upset, or under the influence of drugs, alcohol or medication. · DO NOT alter this product in any way. 125. (1) Where work cannot be done on or from the ground or from a building or other permanent structure without hazard to workers, a worker shall be provided with a scaffold, a suspended work platform, a boatswain’s chair or a multi-point suspended work platform that meets the requirements of this Regulation. O. Reg. 242/16, s. 9. (2) A worker who is on or under a scaffold, a suspended work platform system or a multi-point suspended work platform while it is being erected, altered or dismantled shall be on a part of the scaffold, suspended work platform system or multi-point suspended work platform that meets the requirements of this Regulation. O. Reg. 242/16, s. 9. (b) four times the maximum load or force to which it is likely to be subjected without overturning. O. Reg. 213/91, s. 126 (1). (2) Despite clause (1) (a), a scaffold with structural components whose capacity can only be determined by testing shall be designed and constructed to support or resist three times the maximum load or force to which it is likely to be subjected without causing the failure of any component. O. Reg. 213/91, s. 126 (2). (3) No scaffold shall be loaded in excess of the load that it is designed and constructed to bear. O. Reg. 213/91, s. 126 (3). 127. (1) The failure load of a scaffold which consists of structural components whose capacity cannot be determined by testing shall be established by testing the components in a manner that simulates the actual loading conditions for which each of the components is fabricated. O. Reg. 213/91, s. 127 (1). (2) A professional engineer shall verify and certify the results of a test and the corresponding rated load of the scaffold. O. Reg. 213/91, s. 127 (2). (3) The constructor shall make available to an inspector upon request a copy of the certification by the professional engineer. O. Reg. 213/91, s. 127 (3). (g) shall be adequately secured at vertical intervals not exceeding three times the least lateral dimension of the scaffold, measured at the base, to prevent lateral movement. O. Reg. 213/91, s. 128 (1). (2) A scaffold shall be constructed of suitable structural materials and, if lumber is used, it shall be construction grade or Number 1 Grade spruce. O. Reg. 213/91, s. 128 (2). 131. Only a competent worker shall supervise the erection, alteration and dismantling of a scaffold. O. Reg. 213/91, s. 131. (b) at least 2.4 kilonewtons per square metre. O. Reg. 213/91, s. 134 (1). (2) Each component of a scaffold platform or other work platform shall be capable of supporting a load of at least 2.2 kilonewtons without exceeding the allowable unit stress for each material used. O. Reg. 213/91, s. 134 (2). (3) No scaffold platform or other work platform shall be loaded in excess of the load that it is designed and constructed to bear. O. Reg. 213/91, s. 134 (3). (f) shall have each component secured against slipping from its supports. O. Reg. 213/91, s. 135 (1); O. Reg. 527/00, s. 4. (e) that are cleated or otherwise secured against slipping. O. Reg. 213/91, s. 135 (2).